Card Data Recovery for Windows is the top-ranking card data recovery tool to help Windows users recover lost data from various memory cards, mobile phones, digital cameras, USB drives, PC hard drive and other storage devices. Accidentally delete data instead of saving by mistakenly pressing wrong button. "This product worked quite well with my SD card and saved me a lot of time. Many thanks for your help to recover my lost files. " Standard Mode: Divide data in 4 types – photos, videos, music and other files, allowing you to recover one, several, or all of them. 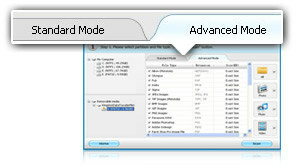 Advanced Mode: Provide more than 40 files formats and you can recover the exact ones if you know the file formats of the lost data. Resume Recovery: You can import previous scan result to resume recovery without a second scan. Recover photos, videos, music of different file formats, such as photos in BMP, GIF, TIF, TIFF, JPEG, JPG, WAV, WMV, AVI, ASF, MPEG, etc. Restore PDF, RAR, ZIP, CHM, ISO, ICC, GDF, NTFS files and more than 300 file formats. Recover data from memory card: SD card, CF card, Memory Stick, Memory Stick Duo, USB flash drive, external hard drive, etc. with various brands such like SanDisk, Kingston, Transcend and Samsung. Restore data from mobile phone (smart phone): Samsung, Nokia, LG, Blackberry, HTC, ZTE, and other existing brands in the market. Retrieve files from digital cameras: Sony, Olympus, Casio, Canon, Nikon, and other brands. 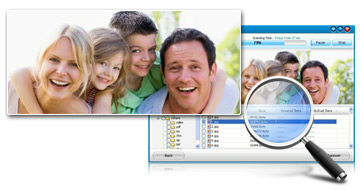 Recover data from PC: HP, Samsung, Sony, Dell, Lenovo, and other laptops and desktops. Preview while scanning and no need to wait till the scanning finishes, which saves more time. Preview and check the lost data for you to recover the exact ones you need, which improves efficiency. Stop or pause scanning as you like, and this also saves your time if you find your data during the process. Recover data from memory card with 3 steps: Scan, Preview, Recover. 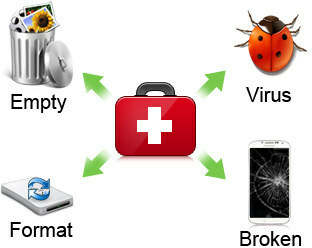 Only read and recover data, no data loss or damage during recovery. Work well on Windows 10/8.1/8 7/Vista /XP, Windows Server 2012 and other Windows OS. All the data are classified into Photo, Music, Video, and others, making it convenient for you to handle. Each interface clearly shows you how to handle and no need to worry about the procedures. USB flash drive, external hard drive, SSD, computer, etc.